The home goods retailer has survived economic downturns before, but another one could slow its momentum. Shares of Bed Bath & Beyond (NASDAQ:BBBY) lost nearly a third of their value during the first half of 2014 on the home goods retailer's dour full-year outlook. They then staged a rally, recouping nearly all of the first-half losses by the end of the year. But worries about Bed Bath & Beyond's future prospects have caused its stock to fall back once more. It's not the same dramatic plunge it took last year, but rather a slow, gradual easing that's seen shares pull back about 10% from those highs. Bed Bath & Beyond might be a cash-generating machine that's attracting private equity money, but investors are right to question just how strong its operations are and whether any weakness will cause its stock to fall further. Here are three good reasons why that just might happen. 1. The economy could head south. The main threat to Bed Bath & Beyond's forward momentum is the economy. While the company managed to come out of the Great Recession relatively unscathed -- if not even stronger than before the economy crumbled -- there's no question that Bed Bath & Beyond hit some major low points on the journey and its stock lost much of its value. It's possible we're heading back toward those dark days. We're even hearing some of the same refrains from that time: the economy contracted in the first quarter, more people are out of the workforce than at any time since the 1970s, Greece might default on its debts, etc. 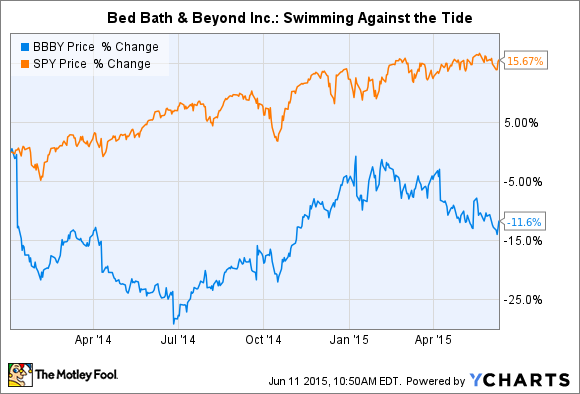 Those conditions and concerns are showing up in Bed Bath & Beyond's earnings. Fourth-quarter net sales were below expectations, comparable store sales growth missed projections, and the company offered relatively weak guidance for the new fiscal year. Had it not been for Bed Bath & Beyond buying up large tranches of stock, its per-share profit would have been much worse. If the economy does contract further, the home goods retailer just might follow. It's not going to go bust, but investors probably shouldn't expect much in the way of profit or margin expansion either. 2. E-commerce competition remains an ever-present threat. It seems like ever since Amazon.com (NASDAQ:AMZN) burst onto the scene, people have expected the Internet retailer to steal Bed Bath & Beyond's market. Though the Internet retailer likely played a role in the demise of financially weaker rivals like Linens 'n' Things, Bed Bath & Beyond has survived and thrived. But Amazon is still a potent threat. That's why Bed Bath & Beyond has moved to invest heavily in its own e-commerce capabilities. There's also growing competition from Wal-Mart and Target, both of which have bulked up their own home goods offerings, as well as some unusual places like Best Buy, which has added more shelf space for things like vacuums and fans. Although the market analysts at NPD Group say spending on home goods expanded 1% in 2014 to $47 billion, that's a significant slowdown from the 4% increase experienced the year before, and it's occurred with more competitors vying for limited dollars. The pie may be growing, but so are the options available to consumers on where to shop. As a result, Bed Bath & Beyond must fight a battle on multiple fronts, which could prove challenging in an economic downturn. Bed Bath & Beyond's store development costs could become a liability. 3. Overdeveloping its brick-and-mortar footprint. Bed Bath & Beyond has for a long time carefully built out its store base to the point where it now has more than 1,000 namesake stores, 96 buybuy Baby stores, and 78 Christmas Tree Shops. It also has several dozen Harmon Face Value stores, and after acquiring Cost Plus World Markets, has some 270 of them as well. Management says it plans to open 30 new stores across all its brands this year, but the new twist is that Bed Bath & Beyond will now self-develop most of them, suggesting it's at greater risk too. Sure, it's a testament to its strong financial position -- but being responsible for the construction and costs of improvements will expose the retailer to the burden of store saturation if the economy sours. It's obvious that a lot of Bed Bath & Beyond's future will be directed by how the economy performs. Unfortunately, many signs have pointed to an economic slowdown: the latest retail sales numbers from the Commerce Department notwithstanding. That doesn't mean the home goods retailer will suffer an implosion, but investors may find that its stock hasn't finished pulling back.